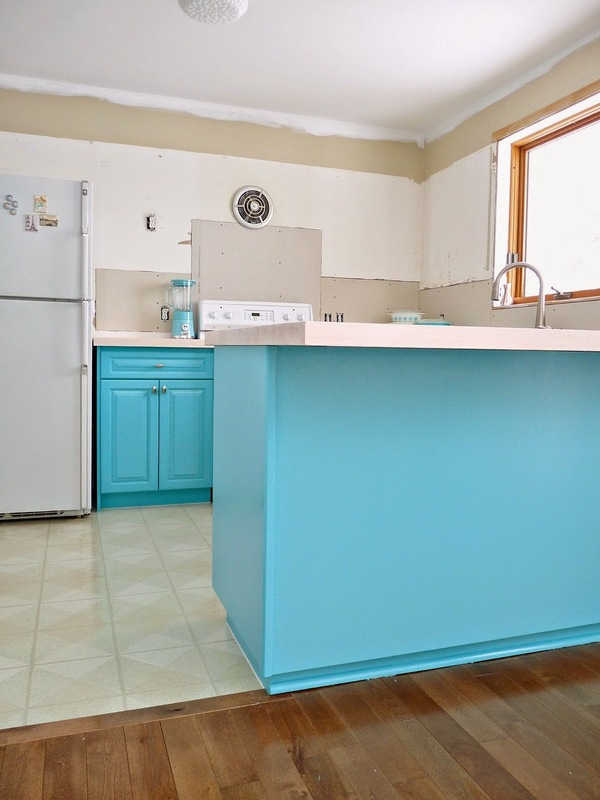 Kitchen Progress: Turquoise Cabinets? Check! After spending the winter in our garage, the cabinet fronts Hubs painted with our sprayer needed a little touch up, but now they’ve been re-installed and all of a sudden the kitchen is looking so good. Sadly, it looks a lot more denim-blue in my photos – I’ve been having a tough time lately, photographing teal and turquoise true to life, which is really problematic given my penchant for anything turquoise. In that elusive third dimension, the colour (CIL Niagara Mist) is nearly identical to the turquoise Pyrex butterprint pattern, so if you’ve seen a piece of that, then you can better envision the colour. Painting the cabinet boxes was straightforward: light sanding, coat of primer, and then three coats of semi-gloss Premier paint, courtesy of my paint partnership with Canadian Tire. Just like when I painted the bathroom cabinetry, I used my small artist’s brush for the narrow cabinet face frames, a two-inch angled brush for the toekick, and a roller for any larger areas, like the section that faces the dining room and the areas beside the stove. The cabinetry wasn’t in the best condition so when I zoom in with the camera some blemishes appear, but the semi-gloss finish, which reflects lights, does a good job of hiding imperfections when I’m not staring at it from three inches away. People say sheen emphasizes flaws but I’m adamant it’s the other way around: matte paint can really highlight flaws. Friday (you already saw how I stained them). gorgeousness is incredible – and we’ve got lots of photos! spinning those turnstiles and seeing the different styles in person. these knobs, which were only $3.00 a piece. 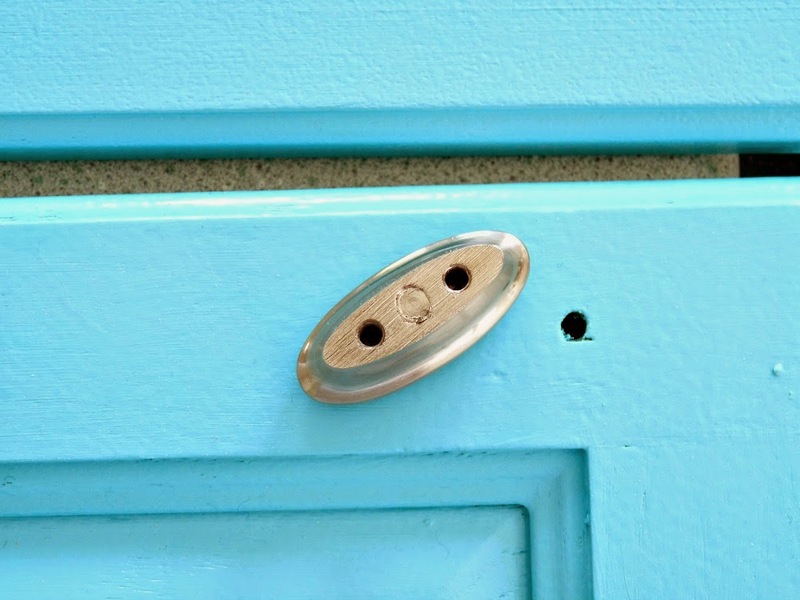 These knobs require two screws for installation and the old knobs only needed one, so we simply added a second screw hole. 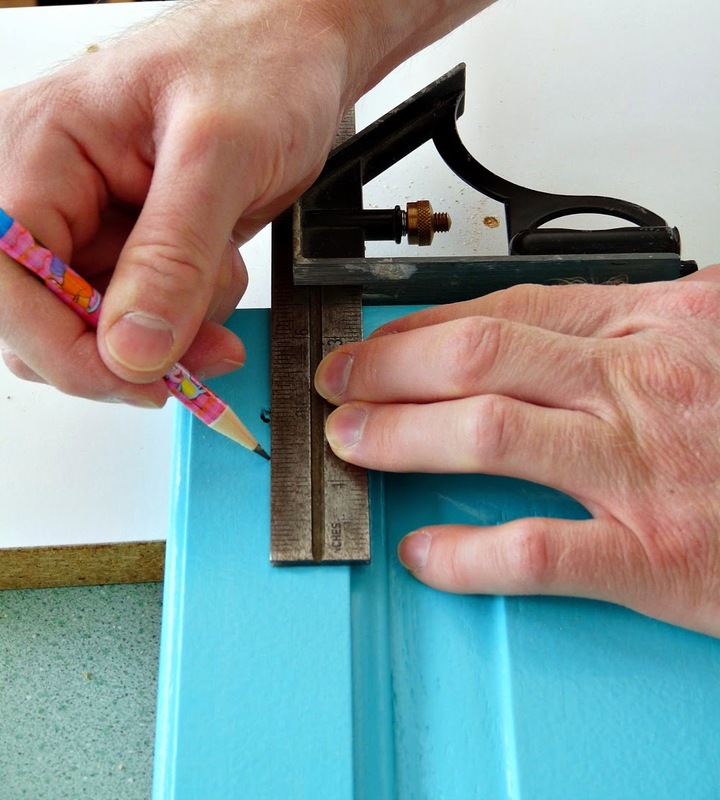 Hubby measured, marked with a pencil, and drilled away (with a wood scrap underneath). For the cabinet drawers, I had filled the hole with wood filler prior to priming and painting, so Hubs just drilled two new holes and centred the knobs. Easy! We made one other inexpensive change: the floor grate. What was previously there was white and rusted, so we bought a $13 replacement, in silver. I’m only mentioning it because it’s Made in Canada! I love finding things made in Canada or the USA. The kitchen is really taking shape, but we still need to paint and install the paneling, add trim to the paneling, replace the window trim, paint and install open shelving, add some bar stools, unpack my Pyrex collection and our dishes, plus build a pantry beside the fridge. But I’m feeling so motivated because it’s already the happiest room in the lakehouse . . . Fantastic. That is a brave color choice and I love it! Kudos to you! Thanks Jane! I've wanted a turquoisen kitchen for so long. It makes me smile everyday! I love love love how your kitchen is coming along!! 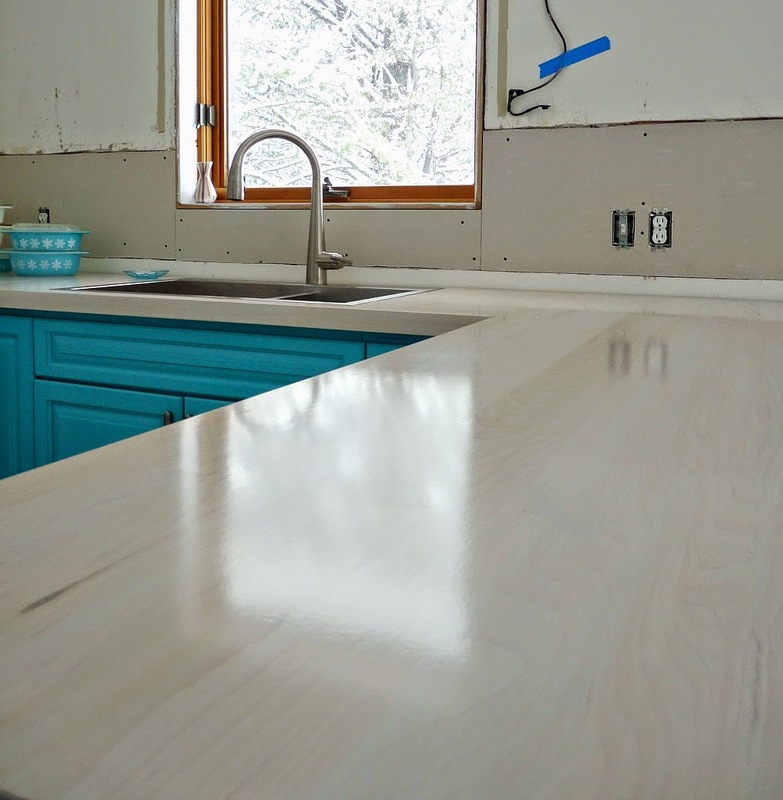 and I would swear those countertops were some sort of stone the way they gleam! I finally feel like we've made some progress. The counters do catch the light nicely, the finish is so pretty. For friday I will try to take some photos that show off the grain. The cabinets look lovely, but I can't get over that counter top. It is like nothing I've ever seen and completely stunning.Bravo. Hi Tanya, the kitchen is really taking shape. The cabinets are really lovely, and my! but that countertop is beautiful! Handy Hubby will be so pleased to hear that!! He worked for many days building then. I'm so amazed at what he accomplished. This looks great! I love the turquoise! I love them!!! Your kitchen is going to be amazing! Thanks Brynne! I'm so excited to finish off those walls. Once we get the open shelving up and my Pyrex unpacked, I think my new hobby will be staring at the kitchen, wistfully. now THIS is going to be a happy kitchen! I'm so excited for this burst of colour because it's such a central space in the house – the first room you see when you walk in from either entrance, plus it's open to the dining room and living room. It's sets the tone for the house: be happy here! Thanks so much for your kind words, Chris. I'm looking forward to taking a peek at your blog, thanks for the link. Soooooo beautiful! 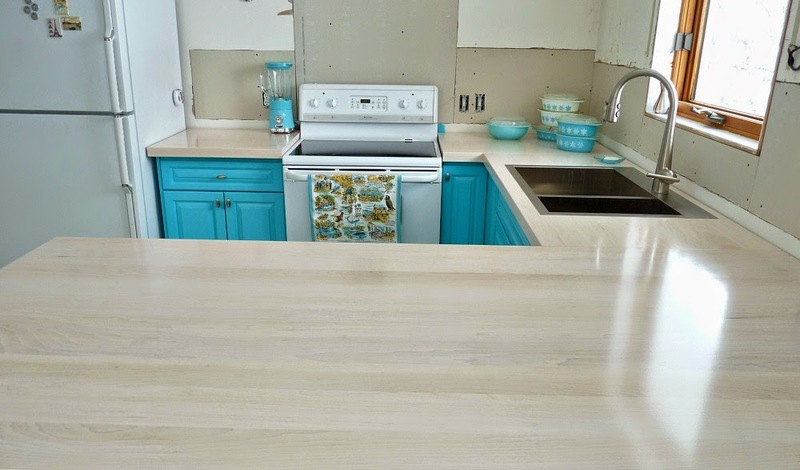 The cabinets do love fantastic with those amazing countertops! How does hubby like the cabinets painted? I know he didn't want to paint them in the townhouse. I need to convince my hubby that we should paint ours dark grey (similar to your bathroom)- they're builder basic maple. Admittedly, the natural colour is nice but they are super cheap construction and impractical so a mini Reno is in order. And with natural light wood the kitchen is so beige I could barf. I am so inspired by your new kitchen. It will look great styled with your lovely Pyrex collection. Thanks!! Hubby does like the cabinets painted. I think he liked the grain and finish of the townhouse cabinets better and, truthfully, I kind of liked them too. The grain glistened when the sun hit it, and it was a really pretty hue. This oak, unfortunately, really has a late 80s/90s vibe to it. Even Hubby's Dad, the woodworker, who NEVER paints wood, was not opposed to us painting this stuff. I was shocked. Both of them say it looks like the typical, 1990s builder kitchen popular here.I have to say, though, that I'm worried how durable the finish will be. 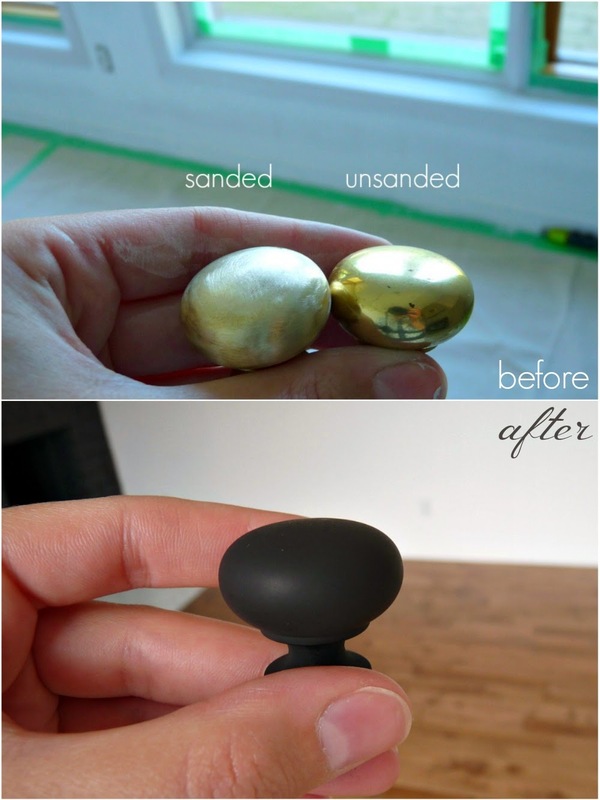 I sanded, primed and painted them but they don't feel durable – even though they have cured. The Rustoleum cabinet covering kit, though, has really held up very well. Maybe it's the deglosser? I'll be sure to share an update once the kitchen has been used and abused. I'm just eyeballing it warily, uncertain of its longevity. But the wood was too ugly to live with.Dark grey would look so sharp in a kitchen. Have you thought about a stain that would allow some grain (Hubbies seem to like that) but still offer you a rich colour? 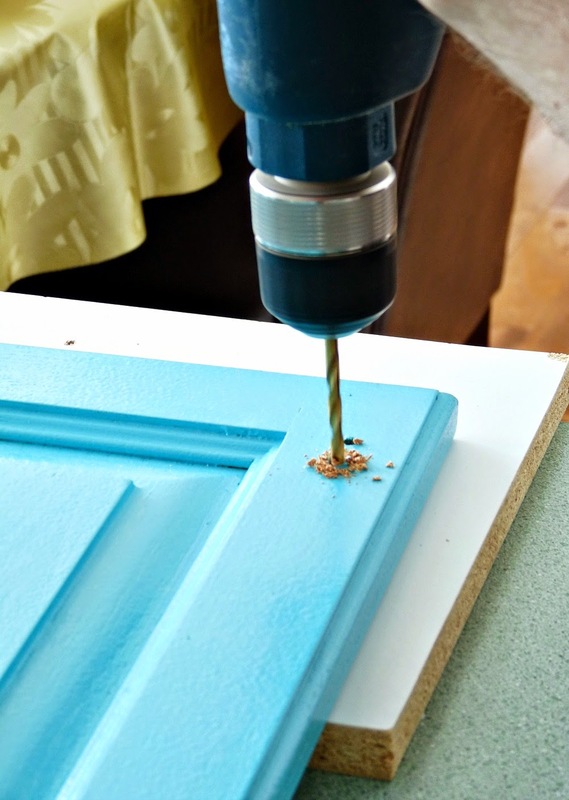 There are some gel stains that I've heard can be applied right over an existing finish. I'm excited to hear about your plans once you decide. Hopefully you can get Hubby on board!! 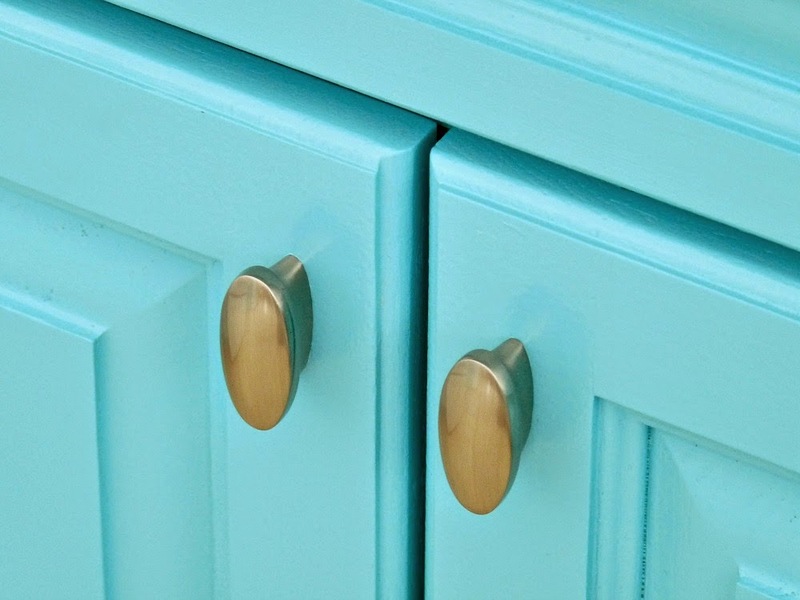 My heart did a little pitter-patter upon seeing that gorgeous cabinet colour! Nice choice! Love love love it! Thanks Courtney!! Turquoise is my favorite colour. 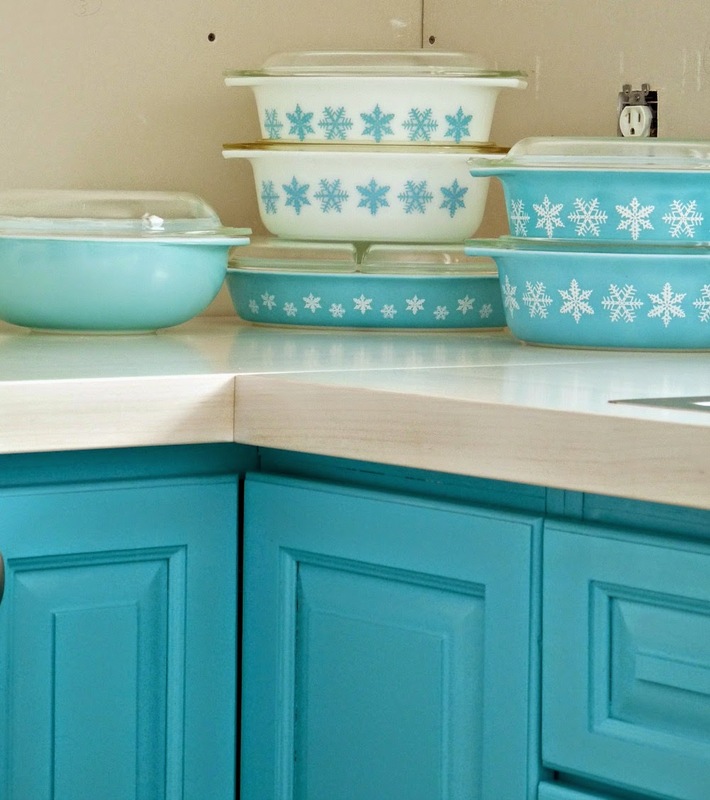 I just ordered a whack of kitchenaid kitchen utensils from ebay in turquoise – I hope they match. If they do, it's going to get a lot more aqua in here once my new utensils are out and the pyrex is displayed. I'm going to start to look a little batty . . . but I'll be so happy! This looks so amazing! I had a dream once about a kitchen with salmon-colored lower cabinets and if they turned out like this, I think it would have a similar fresh, cheery, beautiful effect! Thanks! Cheerful will be nice when we hit rainy season . . . 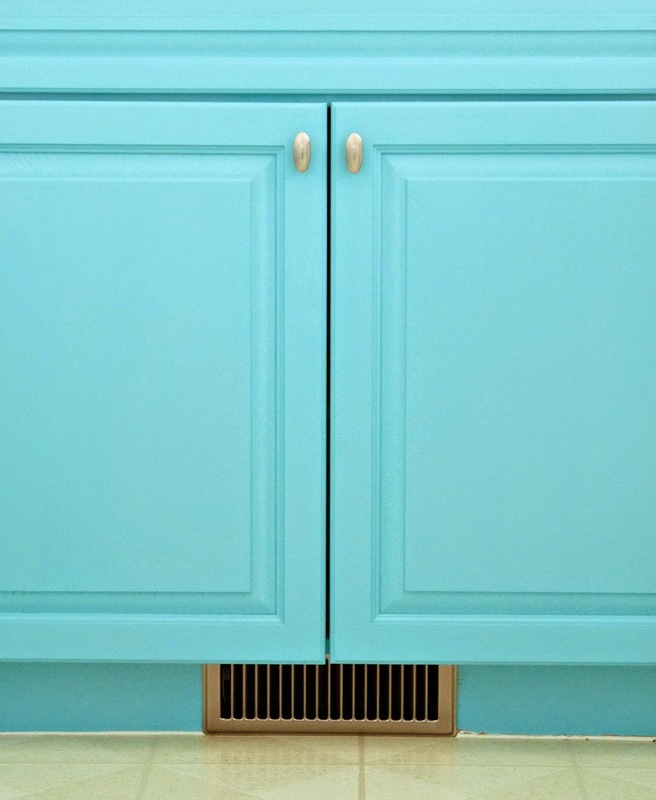 This cabinet color reminds me of Monica's kitchen on Friends! Hello,You did an excellent job on this remodel.I am looking for those exact knobs & I can't find them anywhere. Can you pretty please let me know where you got them? Thank you in advance for any help you might be able to give me. Are you Canadian? I got them from Lee Valley, a hardware store. Great selection but the website is terrible. I'd go in store or order a catalog. 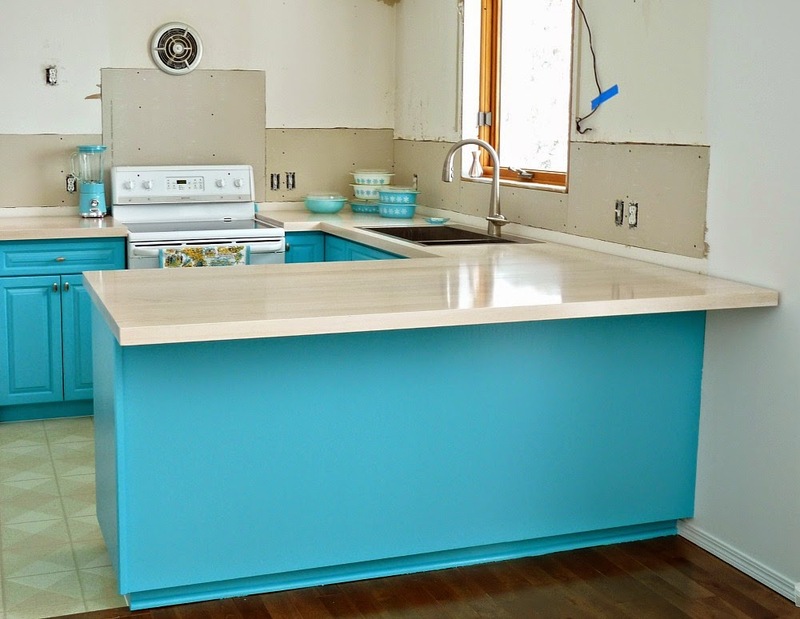 We are having a house built and I really wanted turquoise lower cabinets, but that wasn’t a selection that the builder had. 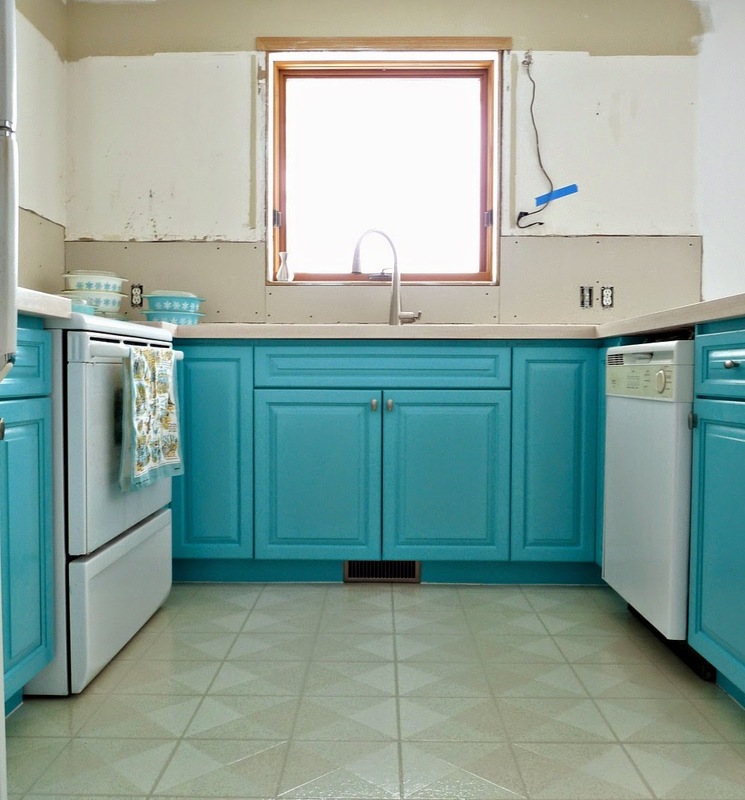 I compromised with white cabinets and a turquoise glass tile backsplash. Congrats to you for getting what you wanted! I saved your paint color to use on my kitchen island! 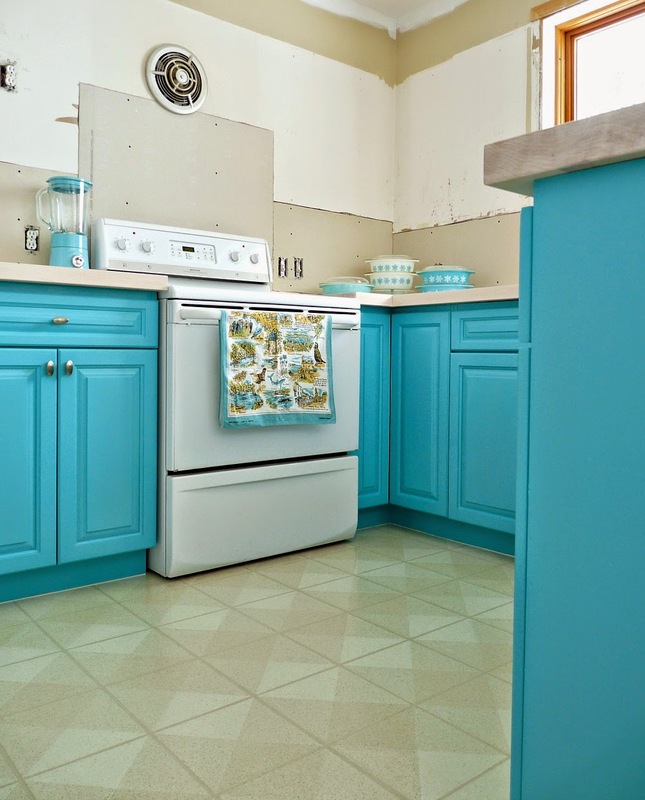 Turquoise tile backsplash and white cabinets sounds perfect! I’d love to see a photo of your island when it’s done. 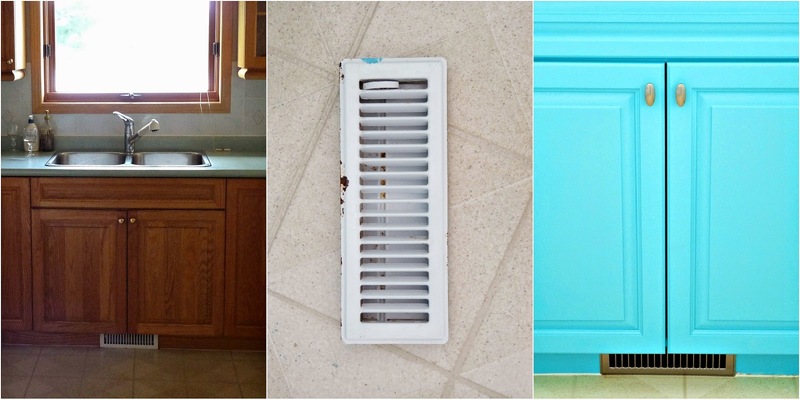 Could you please tell me the brand of paint and the turquoise color? I might hv missed in the article but it is EXACTLY the color I hv been trying to find!! Kitchen is awesome!! Hi, yes of course! It’s CIL Niagara Mist. 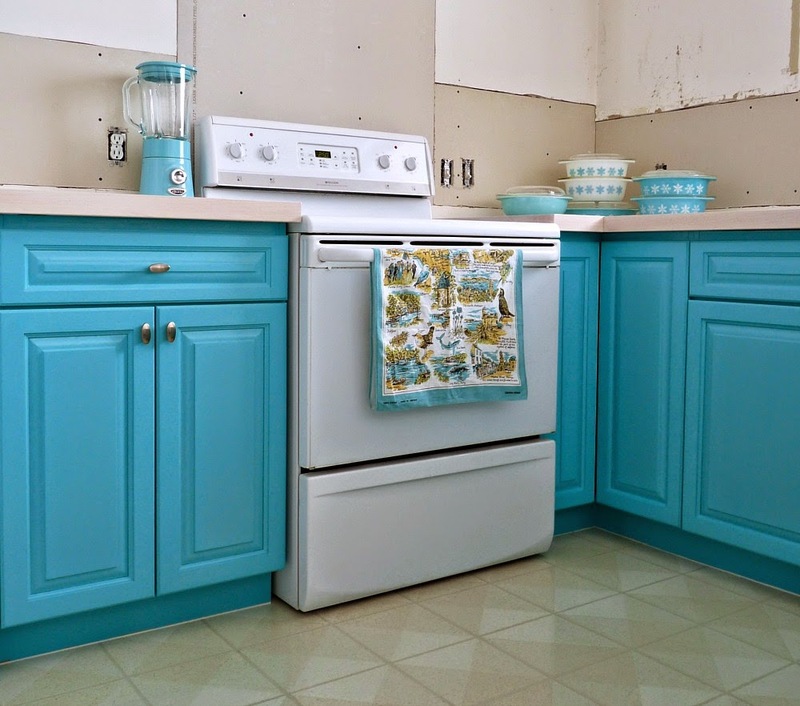 Here’s a better post with the completed room and other sources: Turquoise Kitchen Makeover.